Hello - my name is Carol Cameron. I am a specialist tour organiser for Sri Lanka and The Maldives. 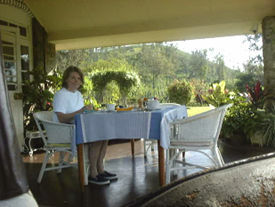 Welcome to our website of Sri Lanka tours, travel and villa rentals. CaroLanka was established by Carol Cameron after returning from Sri Lanka in 1990, having lived there for over three years with her family, and specialises in tours and villa rentals in Sri Lanka. Drawing on her own experience of travelling around Sri Lanka, Carol promoted chauffeur-driven, a la carte tours for the discerning and independent traveller. In 1996 Carol discovered the exclusive beach and inland villas and has been promoting the villa rentals concept in Sri Lanka ever since then. CaroLanka also specialises in unusual and interesting places to stay - some of which are off the beaten track and others that are special in other ways. With up-to-date information from annual return visits we are always finding new and exciting places to stay and visit. CaroLanka aims to give you the flexibility and enjoyment of independent travel, with an emphasis on the personal touch, whether it be for just one or two couples, larger numbers or for any specialist groups. We specialise in personalised itineraries providing a car, station wagon, mini-van or luxury coach with our English-speaking Driver/Guides. Our reliable agent in Colombo is on hand if necessary during your stay.